Pat-a-cake, pat-a-cake, baker’s man… | What About Victoria? Outside my window, I just heard the lovely voice of a little English girl singing, “Patty cake, patty cake, baker’s man…” This is a song I remember singing as a child in the US, though I can’t remember where I learned it.On a hunch, I checked to see if the lovely little ditty had its own Wikipedia entry; it does, of course. 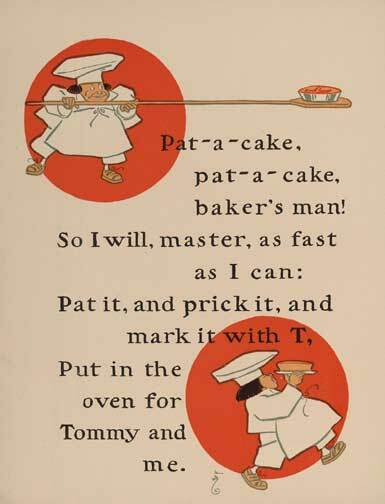 I’ll point you to Wikipedia for more information, but in summary, the nursery rhyme is English in origin, originally from a 1698 play called The Campaigners and further popularized by none other than Mother Goose in 1765. The 1770s might have meant war between the Colonies and the Brits, but little kids on both sides of the Atlantic were probably singing this little tune, perhaps clapping their hands like the girl I heard earlier.